It’s like a pee funnel, but with a bag attached. The pee mixes with the gel and solidifies. Can be perfect for peeing in the tent when camping. Odourless, and can be used multiple times (up to the fill line). Also works great for motion sickness when on a road trip. Can get quite expensive if used frequently. The Travel Jane (or other female urination devices) can be quite difficult to find in stores. If there’s one place where you could look, it’s an outdoor shop like REI in the US, or MEC in Canada. Otherwise, we recommend shopping online. You’ll have the full range of styles and brand options and prices are very competitive. If you’re ever though to yourself, “I’d love to pee standing up,” then you’ve come to the right place! We’re going to review the Travel Jane Disposable Urinal, which allows women to pee while standing. The Travel Jane is unique in that the gel solidifies when it mixes with urine so that disposal is extremely easy. There are plenty of situations where this could be helpful. For example, any kind of outdoor activities like hiking, camping, backpacking, boating, skiing, or climbing. Or, you could be in a place with disgusting bathrooms and you hope to avoid them altogether, or if you must use them, not touch anything. An example might be at a big music festival where your only option is disgusting urinals. It can be really difficult to find the Travel Jane in stores. You can try big outdoor shops like REI (USA) or Mountain Equipment Co-Op (Canada) but there are no guarantees you’ll be able to find them. The Travel Jane is disposable, unlike most other pee funnels you might consider. While it can be a bit expensive to use them only once, you do have the advantage of not having to keep them clean. The good news is that the Travel Jane and Travel John can be used more than once. This is possible because the gel turns the liquid into a solid in a few seconds. Keep using it until you reach the volume indicator on the bag, and once you reach that point, throw it into the trash. In case you’re wondering about the Travel Jane vs. the Travel John, they are exactly the same. Both of these products are made by the same company out of the United Kingdom. The only real difference is colour and packaging. For more, keep on reading for the full review of the Travel Jane Disposable urinal for Women. Disposable, so clean up is really easy. Gel that solidifies when mixed with fluid, which makes disposal extremely easy. Skip nasty bathrooms with a disposable pee funnel. Although it is a disposable product, the bag is biodegradable. You can use this disposable pee funnel more than once. Check the volume indicator on the bag to know when you’ve reached your limit. It’s not messy because the gel turns the liquid into a solid. Can also be used a motion sickness bag for road trips. Spill guard prevents back flow. Also leakproof. Can be quite expensive if you plan to use them on a regular basis. Instead, consider one of the reusable pee funnels (we love the SheWee Female Urination Device). Exactly the same as the Travel John, but with different packaging and colours. It’s a product that’s designed for men, so while it can work for women, it’s not designed for them. The opening is quite small for women. Who Should Use the Travel Jane? The ultimate use for the Travel Jane is when camping. If you’ve ever been in your warm tent on a cold, rainy night, you know how not ideal it is to get up and go to the bathroom. It’s cold out there! With the Travel Jane it’s very easy to pee inside the tent. Fear no more. If you do various kinds of outdoor activities, you know that it can be a bit of a hassle to go pee in certain situations. For example, what if you’re climbing up a big rock face, and need to go pee? This is where the Travel Jane excels. You can pee into the bag, and not have a second thought about it. If you get motion sickness, you’ll LOVE having the Travel Jane with you. It’s an easy way to have a bit of security that you won’t throw up all over your car or clothes. One of the best things about it is that it locks in odours. This is ideal if you’re on a bus or train and not able to stop as soon as it happens. If you have minor knee, hip or foot surgery, it may not be easy for you to bend down to sit on the toilet. If you can’t do this for only a day or two, consider using the Travel Jane instead. If you’ve never used a disposable female urinal before, you might feel kind of nervous about the Travel Jane/Travel John. After all, peeing while standing up is a bit of a new experience for most women. However, it’s easier than you think. All you have to do is unroll the product, position it under your urethra, and then pee. Most people find that using two hands with their legs spread apart and knees slightly bent has the best results. Once the liquid hits the crystals, it turns to a gel and locks in the odour. You can seal the bag up carefully for a second use if it doesn’t gross you out! Once the bag is full, you can dispose of it in the trash, and then use a fresh bag if needed for further uses. Can I Use the Travel Jane Disposable Urinal more than Once? Okay, so you’re thrifty like me and want to save a bit of money? Perhaps you don’t want to keep using a new bag every single time you need to pee. It is certainly possible to use this disposable urinal for more than one use. However, it’s only 28 ounces, so be careful. If you haven’t peed all day, but drank a decent amount of water, it’s possible to overfill it in a single use. This is particularly true for your second use. Be sure to bring toilet paper too, and then you can just throw it in the Travel Jane when you’re done with it. Do a test run (or two) at home in the shower before taking these out on the road. Most people find that a wide stance works best to avoid peeing on their shoes or pants. Many people find that two hands works best when holding the device. Don’t be tempted to fill it beyond the line. This is a bad, bad idea (trust us on that one!). Remember that gravity is indeed a thing! You’ll have to make sure the bag is positioned below you for it to work well. For example, laying on the bed with the bag not really positioned downwards often equals disaster. If you’re looking for a disposable female urination device, the Travel Jane (by the Travel John) company makes a decent option. It allows women to pee standing up, which is ideal on road trips, when traveling or doing outdoor activities, or traveling in underdeveloped countries. I’m sure you can think of at least a couple situations in your own life! We love that the gel in the Travel Jane device mixes with pee and forms a solid gel, which makes clean-up extremely easy. There’s no fuss with trying to “direct” your pee somewhere with the reusable pee funnels, which is often where the disaster happens. By “disaster,” we mean pee all over your clothes or shoes. While we generally don’t love disposable products here at Reusable Menstrual Cups, the Travel Jane can be used more than once due to the gel which hardens the liquid in a matter of seconds. Keep on using it until you reach the volume indicated on the bag, and then dispose of in the trash. Or, learn more about a very similar product here: Go on the Go Disposable Urinal. What about Reusable Female Urination Devices? Here at Reusable Menstrual Cups, we’re ALL about reusable products. They’re cheaper, better for the environment, and also your health in many cases. What about reusable Female Urination Devices? Do they make a better choice than something like the Travel Jane? Pee funnels. They have a large base, and then a tube that directs your urine (for example, the Go Girl Female Urination Device). Tubes that fit right around your urethra. These are smaller and lighter, but do have a bit more of a learning curve to using them correctly (the Pibella for example). Just about the only reason why you should consider the Travel Jane or Travel John over the reusables is if you want to have a bag to contain your urine, instead of directing it onto the ground, or in the toilet. Travel Jane Disposable Urinal: Have your Say! 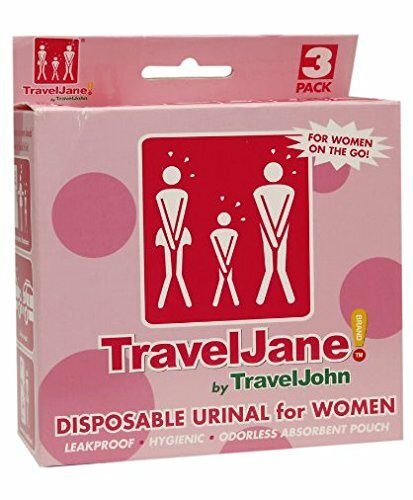 What do you think about the Travel Jane Disposable urinal? Is it a buy, or are you considering one of the reusable female urination devices?